Freeman Wills Crofts has enjoyed quite a revival during the last couple of years. The British Library has reissued several of his best novels, and Harper Collins have reprinted others, both in paperback editions and in some cases as hardbacks under the Detective Story Club imprint. The latter include his third book, The Pit-Prop Syndicate, which first appeared in 1922. Crofts was still learning his trade at that time. Inspector French was yet to be created, and he'd followed up the success of The Cask with the slightly disappointing The Ponson Case. Here, he experiments rather interestingly. The first half of the book follows an amateur investigation into a suspected criminal conspiracy. The second half sees the professionals take over, in the form of Inspector Willis. It's a tricky blend, but I found it appealing. Seymour Merriman (great name!) is cycling in France when he chances upon a strange puzzle. Why would a lorry change its number plate? He comes across a pit-prop exporting business (one of those enterprises that presumably died out long ago) and also a pretty girl. Back in England, he tells a friend, and they decide to return to France to investigate (and Seymour also wants to get to know the pretty girl better). The plot thickens from there. This is a classic Crofts story, meticulously planned and written. And I can't think of many Golden Age stories featuring Goole and Hull, but this is one! In the second half of the book, the investigation dragged a bit, and I found some of the detail a bit dull, much like Seymour's romance. All the same, it's an enjoyable story, and there's also a bonus in the dust jacket artwork, as well as the inclusion of an intro by John Curran and a little-known short story with a railway setting, "Danger in Shroude Valley". Today, I'm truly delighted to be able to talk about a book that has meant a great deal to me over the past three years. After many years of striving, I've finally managed to realise an ambition I've long held as a crime novelist - simply, to write a story that a major publisher loved enough to get behind in a significant way. The book is Gallows Court, publication date is September 2018, and it will be the lead crime fiction title of Head of Zeus (whose other authors range from Ben Okri to Jim Naughtie) this coming autumn. For me, then, a thrilling development. During the recent past, I've combined the writing of the novel with various other ventures, notably The Story of Classic Crime in 100 Books, and another non-fiction project which is still ongoing, and will be for some time. But I've always seen myself first and foremost as a novelist, and I've always tried to develop and progress as a writer of fiction. Writing this novel was an attempt to do something very different, in all sorts of ways, from my previous work. 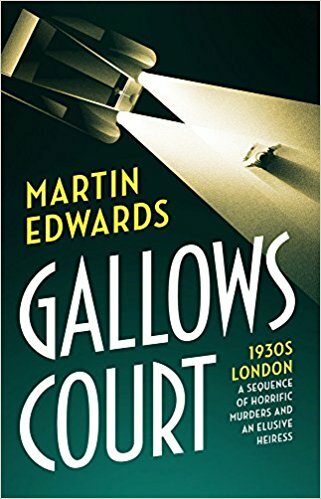 Gallows Court is set in 1930, and it builds on my fascination with that period in our history, and my love of Golden Age detective fiction. But it's not a pastiche whodunit. Rather, it's a novel of psychological suspense, fast-paced, with plenty of plot twists. In writing the book, I deliberately adopted a different approach from that of my other novels. Rather than planning out "whodunnit", I began with a character, and a scenario, and took things from there. This was a bold move, for me, which often felt as though it might prove foolhardy. But as I kept working on the story, it began to come together, and I found myself increasingly gripped by its potential. I wrote the book without the comfort blanket of a contract or expression of interest from a publisher, because I wanted to set my agent the task of trying to finding a really good, fresh home for the book. In many ways, this was a real risk, because it's so easy to become typecast as a writer, and publishers do not necessarily want writers to change direction. Thankfully, Nic Cheetham of Head of Zeus "got" exactly what I was trying to do - an incredibly lucky break for me. I've worked with many lovely publishers over the years, and I must say that I'm exceptionally excited by this relationship. And I'm keeping my fingers crossed that readers will love the book as much as Nic did. The book cover image is subject to change, but I think it captures the period setting. At the British Library the other day, I did a podcast with two splendid bloggers and locked room enthusiasts, Jim and Dan, and towards the end I talked a bit about the new book. Here's a link to the whole podcast - and do check out their blogs, The Invisible Event and The Reader is Warned, both of which are excellent. The late Robert Barnard was a great admirer of Jean Potts' novels. As well as being a novelist of renown, Bob was a savvy critic; over the years, he recommended quite a few writers to me, and I don't think any of them have ever disappointed. But it's taken me a long time to get round to reading Jean Potts. When I did, I decided to start with her debut novel, Go, Lovely Rose. The novel was first published in 1954, but it's a very mature piece of writing for a beginner; no doubt this is due to the fact that Potts had served a literary apprenticeship as a writer of short stories before trying her hand at a full-length story. It proved to be a good move: Go, Lovely Rose won an Edgar Allan Poe award from the Mystery Writers of America. Rachel Buckmaster returns to the small town of Coreyville, where she and her brother Hartley grew up, following the death of Rose Henshaw. Rose had been living in Rachel's family home, thanks to a mystifying provision in the will of Rachel's late father. Mystifying because Rose was a nasty piece of work. Rachel had been glad to escape her influence, and she fears that Rose's spiteful nature may have driven Hartley to pushing the old woman down the cellar stairs. For Rose's death means that the siblings can now cash in by selling the house. Soon it becomes apparent that Hartley was not the only person with good cause to wish Rose ill. Rachel finds herself caught up in a teasing mystery, and Potts builds the suspense with an expertise remarkable in a first time novelist. When she died in 1999, Ed Hoch (who was, like Bob Barnard, a very perceptive judge of these things) praised her gifts of characterisation, and her ability to evoke authentic small-town middle-America settings. These qualities are on display in her impressive debut novel. I'm not sure if she ever surpassed it in her later work, but I have more of her books, and I enjoyed this one enough to be determined to give them a try. The Bird with the Crystal Plumage marked the debut in 1970 of Dario Argento as a film director. The movie was a big success, and he proceeded to become known as "the Italian Hitchcock", although as he has himself admitted, his output differs from Hitchcock's in many respects - even if both men are Catholics, with an acute sense of sin that is relevant to their work. I find it interesting that Argento was inspired to write the film in part by Fredric Brown's excellent thriller The Screaming Mimi, and in part by the film The Spiral Staircase, based on a novel by Ethel Lina White. The connection between these works isn't obvious, but it is there for those who want to look for it - rather like well-hidden clues in a mystery. Tony Musante plays Sam Dalmas, an American holidaying in Rome with his girlfriend Julia (Suzy Kendall). Walking past an art gallery, he sees a bizarre sight - a woman is stabbed after grappling with a leather-clad assailant. His attempt to save her is thwarted, but even so, she survives. The Rome police are investigating a series of killings of women in the city, and Sam forms a bond with the chief detective, while pursuing an investigation of his own. There are some gripping set piece scenes - for instance when a brutal hitman in a yellow jacket hunts Sam down in a coach park. Some of them are set in darkened rooms, with lights and telephone lines cut - yes, Argento plays around with cliches, but he does so in an arresting way. A soundtrack by Ennio Morricone offers a jaunty bonus to the action, and although the psychological explanation put forward for the crimes struck me as dodgy to say the least, I thought this film - which launched the "giallo" movement of lurid Italian crime films - was very watchable. I've arrived home after an action-packed few days in London. Whilst I was in the capital, I received the delightful news that The Story of Classic Crime in 100 Books has been shortlisted for a Macavity award by Mystery Readers International. The book has now received five major award nominations, three in the US, two in the UK, something I never dreamed of a few years ago when I first became involved with the British Library. My trip included a variety of CWA events, notably hosting the annual lunch for former CWA chairs, an extremely convivial occasion in Covent Garden, a CWA board meeting, and the Detection Club's summer dinner at the Garrick Club. There was also a meeting with publishers to discuss marketing my new novel - more news about that very soon. I caught up with a number of old friends, including Tim Benson, with whom I went to school; among other things, he's now a guide at the Royal Academy, and he took me around the Summer Exhibition. If you like art, it's really a must-see. Saturday saw the fourth Bodies from the Library conference at the British Library, and it proved to be another enjoyable occasion. The only downside is that because the programme is so full of things to do, there's never enough time to chat to all the people with whom one would like to catch up. But you can't have everything, and I'm delighted that Bodies is to return next year. There are detailed reports of the day on two of my favourite classic crime blogs, In Search of the Classic Mystery, from which I've taken the photo (well, crime is our shared enthusiasm...), and Cross Examining Crime. I was also delighted to chat to two more excellent bloggers, Jim and Dan, with whom I recorded a podcast about impossible crimes. More about this another day. Regular readers of this blog will know of my admiration for the books that Pierre Boileau wrote in tandem with Thomas Narcejac. Their excellent crime stories were by no means limited to the books that were brilliantly filmed as Vertigo and Les Diaboliques. They were, like Hitchcock, masters of suspense. They were also very clever plotsmiths, and The Tube is a case in point. The book was originally published in France in 1958, under the title L'ingenieur aimait trop les chiffres, and was translated into English in 1960 by Robert Eglesfield. It continues to surprise me, by the way, that some of the duo's work remains untranslated. You'd think that their success would make their work very much in demand. In this novel they set out to update the locked room mystery. We are presented with a classic impossible crime scenario, but in what was then a highly topical and controversial setting - a nuclear laboratory. The story opens with a shooting. The victim is a scientist who has been working on a nuclear device, misuse of which could kill millions. Not only is it impossible to figure out how the killer escaped detection - the tube containing the lethal material has gone missing. Yes, I'm afraid that health and safety systems at the lab were astonishingly lax. The story is told with characteristic pace, and assurance - Boileau and Narcejac really were very skilled writers. They were also pleasingly ingenious. Their taste of the macabre is not quite so much in evidence here as in some of their mysteries; then again, the threat of the exploding tube will be potent even for most readers' tastes. It's a quick, light read, and I'm surprised that nobody has seen fit to reprint the story in English for almost sixty years. Michael Gilbert's The Crack in the Teacup, first published in 1966, was a book I borrowed from the library when I was about thirteen or so, and discovering what an entertaining writer he was. In those days, of course, he also seemed very contemporary in comparison to Christie and Sayers, for instance, and this element of his writing also appealed to the young Martin Edwards. I remember really enjoying this book in my youth, and wondered how it would hold up now that I'm so much older. To my delight, it gripped me from start to finish. And because I've now had a lifetime in the legal profession, I appreciated Gilbert's wry observations about legal life much more than I could have done all those years ago. And that is despite the fact that this is in many ways a low-key book, quite close (as was The Dust and the Heat) in style to a mainstream novel, and not quite what you'd expect from a conventional thriller or detective story. Anthony Brydon, the hero, is a young solicitor. He's 23, and already a partner in his firm (blimey; wouldn't happen today) and has no experience with women (blimey again) despite his eagerness to put that right - something he achieves over the course of the story. The setting is a pleasant, well-heeled coastal town. The place seems almost idyllic, but something unpleasant is going on beneath the surface. Anthony becomes convinced of the existence of some form of corrupt conspiracy, and delves into local politics and planning law in the course of his unlikely investigation. And along the way, The Crack in the Teacup turns into a sort of genteel British counterpart to Dashiell Hammett's Red Harvest, but with much less bloodshed, as Gilbert presents a compelling picture of the way that a society that can be ruined by corruption. And, Gilbert being a pragmatist with a cynical turn of mind, the result of Anthony's investigations is not quite what one might expect. A book as under-stated as this won't appeal to everyone. There isn't even a killing until very near the end. But if you like cool, exceptionally readable and slyly humorous writing, and if you're interested in a picture of English provincial life in the 60s, you'll find a lot to please you in The Crack in the Teacup. It's one of the best books Gilbert ever wrote. The title, by the way, comes from W.H. Auden. Horace McCoy's excellent Thirties novel, They Shoot Horses, Don't They? was turned into an equally good film in 1969 by Sydney Pollack. The book is short, and the film is long (perhaps too long), but in different ways they present a chilling story about a dance marathon of the kind that was popular in Depression era America. We might be tempted to feel rather superior about the behaviour of the contestants, organisers, and audiences of these dreadful events, when people half-killed themselves dancing for hour after hour in the hope of winning cash prizes - until we realise that in many ways the marathons were simply forerunners of the modern reality TV show. They appeal to much the same instincts. The excellent cast includes the likes of Bruce Dern, in an early role, Red Buttons, and Michael Sarrazin, but there are three stand-outs. Two are contestants - Jane Fonda and Susannah York - both of whom give superb performances. York was nominated for an Oscar, and must have been dismayed not to have won. Like Fonda, she was such a beautiful woman that perhaps her very considerable acting talents tended to be under-estimated. One person who did win an Oscar was Gig Young, who plays the deeply unpleasant M.C. Again, his is an outstanding performance. But Young's story was a very sad one: he was an alcoholic who, six years after this film was made, murdered his fifth and latest wife and then killed himself. I first saw this film a long time ago. If anything, I liked it even more the second time around. It's a very powerful story, and despite the movie's length, I think it shows Pollack's great ability as a film director. And it's a reminder of what a compelling and interesting writer McCoy was. Few books give quite such a memorable insight into life during the Depression, and the same can be said of this very watchable film. The Challenge is a British film, roughly in the film noir tradition, written and directed by the prolific John Gilling. The movie dates from 1960 and was known in the US as It Takes a Thief. Neither of the titles is particularly inspiring, and given that the lead role was allotted to Jayne Mansfield rather than Anthony Quayle, I sat down to watch it without very high hopes. I soon realised that I was actually watching a film which is surprisingly gripping, and at times rather dark and disturbing. Quayle plays Jim Maxton, an essentially decent if rather dim widower with a young son. He is besotted with a glamorous blonde woman called Billy (Mansfield), and dreams they'll have a life together on a farm. But Billy is mixed up with a bunch of criminals, and persuades Jim to take part in a violent robbery. Things go awry, and just after Jim has hidden the loot in a remote rural location, he is picked up by the police following a tip-off. He is sent to prison, but keeps his mouth shut about his fellow villains and about where he's hidden the cash. When he emerges from jail, the gang want their share of the money. The police are also keeping a close eye on things, as they are determined to arrest the criminals who evaded detection. Jim goes to live with his mother (Barbara Mullen) and six year old son, but things take a nasty turn when Buddy is kidnapped, and one of the gang members, a psychopath called Bud (Peter Reynolds) contemplates killing the boy. I'm back from Alibis in the Archives at Gladstone's Library, the second week-end event celebrating the British Crime Writing Archives which are held there. As archivist of the CWA and of the Detection Club, I set up the BCW Archives, and as a result found myself organising Alibis, in conjunction with the Library's wonderful team, brilliantly led by Louisa Yates. The week-end was, like last year, a sell-out. The plan is for Alibis to take place again next year, from 22-24 June, and I encourage you to make a note of those dates in your diary! This year's programme kicked off on Friday evening with "Bannocks and Blood", a murder mystery written by Ann Cleeves which was good fun. Then on Saturday morning, Simon Brett got everyone in the right mood with his extremely witty Golden Age murder mystery - in verse. Andrew Taylor talked about three real life cases in which he has a personal interest and then interviewed me about collecting crime fiction. To illustrate some of my themes during the conversation, I brought along various books, correspondence, and ephemera from my own collection, and there was a chance for members of the audience to have a look at these before Sarah Ward talked about crime in Derbyshire. After lunch, Ruth Dudley Edwards talked about subversive crime writing, and Mike Jecks about historical mysteries. Then there was a special treat - Professor James Grieve, the leading Scottish forensic pathologist, discussing some famous cases. The day's formal programme ended with a crime writers' panel - see the photo, taken from The Puzzle Doctor's blog about the weekend. Yesterday began with Jessica Mann talking about female crime writing, and I discussed the BCW Archives with Peter Lovesey and Sheila Mitchell (widow of H.R.F. Keating) before Peter Lovesey closed the show with a very witty account of the calamitous crime writing of James Corbett. By the end of it all, I was just a little tired, but also exhilarated as a result of the enthusiasm of the delegates (and indeed my fellow speakers) which really did make all the work and the planning worthwhile. A number of crime writers have, over the years, made effective use of the sinister qualities of some animals. Stories set in a zoo are, however, pretty rare, Freeman Wills Crofts' Antidote to Venom excepted. Mind you, some years ago, I planned out a short story with just such a background, after undertaking a behind-the-scenes tour of Chester Zoo; that story never got written, due to lack of time, and one of these days I may return to it. These musings are prompted by my latest foray into the works of that interesting crime writer Ethel Lina White, and her penultimate novel. The book in question is The Man Who Loved Lions, and it was published in 1943, the year before White's death. In the US it was known as The Man Who Was Not There, which although not a terrible title isn't quite as evocative; I'm puzzled as to why it was felt the change was desirable. Anyway, the set-up of the story is tantalising and full of promise. Ann Sherborn has recently returned to Britain after years abroad. Seven years earlier, at the age of sixteen, she was a member of a group of seven youngish people who dubbed themselves "The Sullied Souls". The leader of the group, Richard, proposed that seven years later, they should hold a reunion at "Ganges", the home of his uncle (who would, he expected, be dead by then). Richard was always an unpleasant character, but Ann was in love with another member of the group, Stephen, so she heads for Ganges in the hope that he will show up there too. It turns out that Richard's uncle is still very much alive. And he has created his own private zoo at Ganges: he is the man who loves lions. Richard is as odious as ever, and while one or two other people present at Ganges are also unappealing - but Stephen, alas, is not there. The presence of wild animals in the grounds contributes to several atmospheric scenes. Yet I found this book rather frustrating. The notion of the private zoo has huge potential, as did the reunion concept, but I didn't think that the storyline as a whole lived up to its initial promise. In particular, the bickering between some of the characters was rather tedious. All in all, after a good start, the novel fails to deliver. I have to rate it as a disappointment. Nobody Runs Forever, also known as The High Commissioner, is based on a novel with the latter title, written by the Australian Jon Cleary. I've never read anything by Cleary, but when I was growing up, paperback editions of his novels were popular, and I bracketed him, rightly or wrongly, with the likes of Desmond Bagley, Alistair MacLean,and Geoffrey Jenkins. The book introduced Scobie Malone, an Australian cop who became a long-running series character. In the film, he's played by Rod Taylor, who was probably at the height of his fame in the late 60s. Scobie is summoned to Sydney to go on a special mission to London - to bring back the Australian High Commissioner, who is suspected of having murdered his first wife. The order comes, incidentally, from Russell Napier, the veteran cop from the Scotland Yard TV series, whom I hadn't realised was indeed Australian. In London, Scobie is persuaded by the High Commissioner - Christopher Plummer, at his most charismatic - that he needs a few days' grace before returning home, in order to conduct delicate (if rather vague) negotiations about world peace. Plummer's character proves to be a target for assassination, and Scobie finds himself confronted by a host of sinister and mysterious characters ranging from Dahlia Lavi, Burt Kwouk, Clive Revill, Lee Montague, and Derren Nesbitt. Overall, this is a competent rather than memorable thriller. The script-writer, Wilfred Greatorex, was a familiar name on the credits of TV shows at the time, and the ingredients are good, but I have never been a huge fan of Rod Taylor, who was, let's face it, no Sean Connery. Personally I'd have liked the storyline to focus more on Plummer's character. I found him more complex and more interesting than Scobie. Barry Forshaw's latest book, Historical Noir, published by Pocket Essentials, is a pleasingly concise, chronological survey of historical crime fiction which ranges from Lindsey Davis, chronicler of Ancient Rome, to authors whose chosen time period is rather more recent, such as James Runcie, Laura Lippman, and William Shaw. I should declare that there's an entry about myself, so I won't pretend to be wholly unbiased, but that said, I can assure you that I'd have enjoyed, and would have learned from, this book even if my work been completely overlooked. If you like history blended with mystery, you'll find here innumerable tips about what to read next, as well as pithy discussion of a sub-genre that is much more diverse than is often acknowledged. One of the great merits of Barry Forshaw's writing is its readability; another is his lively enthusiasm for the genre. If you want lengthy academic disquisitions about crime writing, there are plenty of those around nowadays (though most will set you back a lot of money), but the "noir" series of genre studies that Barry has produced in recent years is packed with information and insight at a bargain price. Some of those insights stem from Barry's past experience as a judge of the CWA Historical Dagger; others come from the authors themselves. There are many interviews with crime writers, again including myself, so the book contains a valuable range of viewpoints on this fascinating sub-genre. 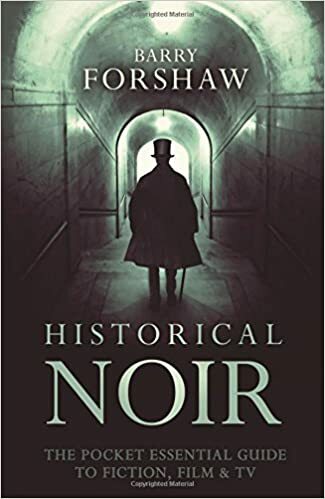 A word about the title, by the way: the introduction explains that "noir" is used here simply as a synonym for crime; it is, in effect, a brand for the series, and does not imply that the books discussed are invariably dark and disturbing - far from it. It's customary, when reviewing a book such as this, to pick up on alleged omissions, and to challenge some of the author's judgements. Customary, and sometimes an excuse for the reviewer to show how well-read he or she is. On this occasion, I won't be tempted down that path. I'll simply say that I appreciate Barry's observation that Dancing for the Hangman is "a book to make readers wish that the versatile Edwards might tackle the historical crime genre more often." I'm pleased to say that those readers won't have much longer to wait for my next foray into the past - more news about this soon! Rather more than a decade ago, I was sent a catalogue of books by a collector who was seeking to dispose of some of his treasures. A good many rare titles by Freeman Wills Crofts were available, some of them signed; although at that time I had very mixed feelings about Crofts' work, I was tempted and I fell. Taking a deep breath, I splashed out on five books. If I wondered whether I'd regret it, these days my only regret was that I didn't snap up some of the other titles that were on sale. With rare books, one has to be opportunistic, since the chances are that one will never get a second chance. Today, I appreciate Crofts much more than I did, even though there's no denying his limitations as a writer. What's more, because he wrote a good deal, sometimes his standards slipped. But The Affair at Little Wokeham, first published in 1943, is a pleasing inverted mystery, set in the pre-war era. It's an inverted mystery, but rather different from Crofts' three previous ventures into this sub-genre. Each chapter is told from the viewpoint of one of five main characters - four of them are embroiled in the case, the fifth is Inspector Joseph French. It's a device that works well. At the time this book was written, Crofts had long been resident in Guildford, and Little Wokeham is a village in the area he was familiar with. We are first introduced to Anthony Mallaby, a likeable if naive doctor who settles there, and falls in love with a young woman called Christina Winnington. She is the niece of one of those unappealing elderly rich folk who so regularly crop up as victims in murder mysteries. And soon we watch Guy Plant plan the murder of old Clarence Winnington. As so often with Crofts, the story turns upon a cleverly constructed alibi. Guy's cunning plan does, however, entail involving someone else in his plot, a high-risk strategy to say the least. When the crime is committed, French is initially at a loss, but the reader can be sure that he will pursue the murderer to the bitter end, and so he does. I really enjoyed this story, although it didn't appeal to me as much as Antidote to Venom, which I regard as Crofts' finest inverted mystery, given the unusual setting in a zoo, ingenious murder method, and rather likeable protagonist. Guy is a nasty piece of work, and we don't empathise with him as much as is, I think, desirable in a story like this. Instead, our main sympathies are directed towards Mallaby, who finds that one terrible mistake puts his own life in jeopardy. Definitely worth reading.